Home CDN , children , crafts , feature , holiday , holidays , homeschool , March , papercrafts , printables , US , worldwide March 19th - Featuring Poultry Freebies! March 19th - Featuring Poultry Freebies! -- Celebrates chicken, turkey and other birds we commonly consume. Chickens were introduced to America by the European explorers in the 16th century. Chicken consumption in the United States increased during World War II due to a shortage of beef and pork. There are so many different ways to cook poultry - including roasting, baking, frying, grilling, sautéing, steaming and broasting. Celebrate today with scrambled eggs for breakfast, a turkey sandwich for lunch, and barbecue chicken for dinner. -- The most comprehensive guide to date on raising all-natural poultry for the small-scale farmer, homesteader, and professional grower. 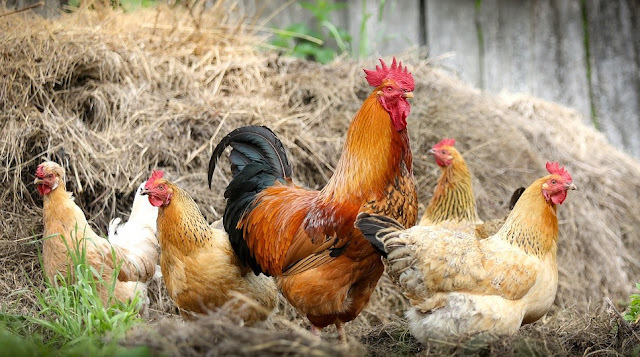 The Small-Scale Poultry Flock offers a practical and integrative model for working with chickens and other domestic fowl, based entirely on natural systems. • Chicken People -- Takes a humorous and heartfelt look at the colorful and hugely competitive world of champion show chicken breeders. A real life Best in Show but about chickens, the film follows the struggles and triumphs of both humans and their chickens on the road to compete at the Ohio National Poultry Show, considered the Westminster of Chickens. - On March 19th, a full Moon of rare size and beauty will rise in the east at sunset. It's a super Perigee Moon -- the biggest in almost 20 years. The last full Moon so big and close to Earth occurred in March of 1993, says Geoff Chester of the US Naval Observatory in Washington DC. I'd say it's worth a look. - A day to celebrate everything great about chocolate and caramel. The union of chocolate and caramel is probably one of the greatest food combinations ever created. The caramel combined with rich chocolate results in a melt-in-your-mouth unforgettable experience! - People across the world celebrate today as Let us laugh day. So on this Let us laugh day, let us all vow to have a hearty laugh! Remember, laugh with others, not at others! - A perigean spring tide is when the moon is closest to the Earth during the spring tide. Tides of maximum height and depression produced during this period are known as Spring tide. Even higher than a normal spring tide are the perigean tides. Perigean Spring tides can produce unusually intense flooding along the coastal regions. Low amplitude tides are known as neap tides. Neap tides are especially weak tides. - The Feast of St. Joseph or Solemnity of Saint Joseph is in Western Christianity the principal feast day of Saint Joseph, Spouse of the Blessed Virgin Mary. It is a Solemnity in the Roman Catholic Church, and also a feast in the provinces of the Anglican Communion, and a feast or festival in the Lutheran Church. Saint Joseph's Day is the Patronal Feast day for Poland, persons named Joseph, Josephine, etc., for religious orders, schools and parishes bearing his name, and for carpenters. - The famous cliff swallows of San Juan Capistrano, that leave town every year in a swirling mass near the Day of San Juan (October 23), are returning from their winter vacation spot 6,000 miles south in Goya, Corrientes, Argentina. They land at the mission in San Juan, California, on or around St. Joseph's Day, March 19th, to the ringing bells of the old church and a crowd of visitors from all over the world who are in town awaiting their arrival and celebrating with a huge fiesta as well as a parade. - So called by Native American tribes of New England and the Great Lakes because at this time of year there are signs of earthworms as the ground thaws in preparation for spring. - At 9:30 PM, EST on March 19, 2003, two hours past a deadline for Iraqi dictator Saddam Hussein to step down from power, US and British forces began air strikes against his regime. A ground campaign (adding Australian forces) followed quickly, and by April 9th, Baghdad was under the control of allied forces and Hussein had disappeared.